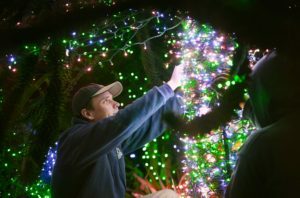 For many years now, Point Defiance Zoo & Aquarium has been saving energy every night of Zoolights with LED bulbs – in fact, we’ve been totally LED since 2014. But now the Zoo will be making energy during the day as well, thanks to 71 brand-new solar panels on the roof of a building most visitors don’t even think about. Northwest Wind and Solar installs the Zoo’s new solar panels in September. “Okay, are you ready?” asks Matt Wright, lead foreman at Northwest Wind and Solar, as he takes one end of a 78×39-inch solar panel. As a colleague takes the other, the two nod, then lift in synchrony, hauling the panel along to join a row of others on the roof of the Asian Forest Sanctuary building. The view, out over Point Defiance Park and glistening Puget Sound, is stunning. 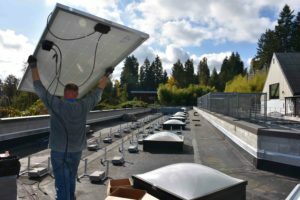 And the rooftop is already balmy on a September day – the perfect spot to generate solar power for Tacoma’s zoo. Even better, more than half the cost of the solar roof was paid for by funding from Tacoma Power’s Evergreen Options program. Customers voted for the Zoo’s project in a 2017 online solar installation grant contest. After evaluating all the buildings in the Zoo, Tacoma Power chose the behind-the-scenes animal care building deep inside the Asian Forest Sanctuary – a building not visible from the main path, but which had optimal southern orientation and no tree cover. The remaining costs – under $40,000 – were paid for by the Zoo, and in September 2018 the installation began: 71 panels, each screwed onto a row frame and connected down to an electrical inverter on the side of the building. Every day – including cloudy ones – the panels silently generate renewable energy for a total of around 26,000 kilowatt hours per year . That’s a lot of power. On a typical residential roof, that could power the home all year long, saving up to $3,000. In carbon dioxide savings, it’s the yearly equivalent of taking 99 cars off the Tacoma-Seattle commute. And in fact, Tacoma households can also choose renewable energy, either by installing their own solar panels or enrolling in Tacoma Power’s Evergreen Options program, which sources power only from renewable resources. Despite its rainy reputation, Washington is a great place to generate solar power, with its long, sunny summer days. In fact, we receive more solar energy than Germany , the leading global solar user. 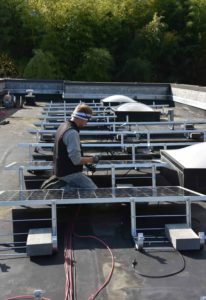 Investing in solar can save consumers thousands of dollars – you can find out more at solarwa.org. For the Zoo, which runs 24-hour heat and water pumps to keep its land and aquarium animals healthy and comfortable, the new solar roof supplies only part of the power usage. But it’s an important part, an example of how public and private buildings alike can move toward renewable energy that’s good for us and our planet. A Zoolights crew member puts up landscape LEDs. So as you wander around the Zoo during the day or at Zoolights at night, spare a thought for our hardworking solar panels and LED lights, combining to help save energy – and our planet.